You know how some autumn nail polish collections disappoint on the Fall-appropriate shades? This CND range isn't like that. Greetings fellow polish nerdies! 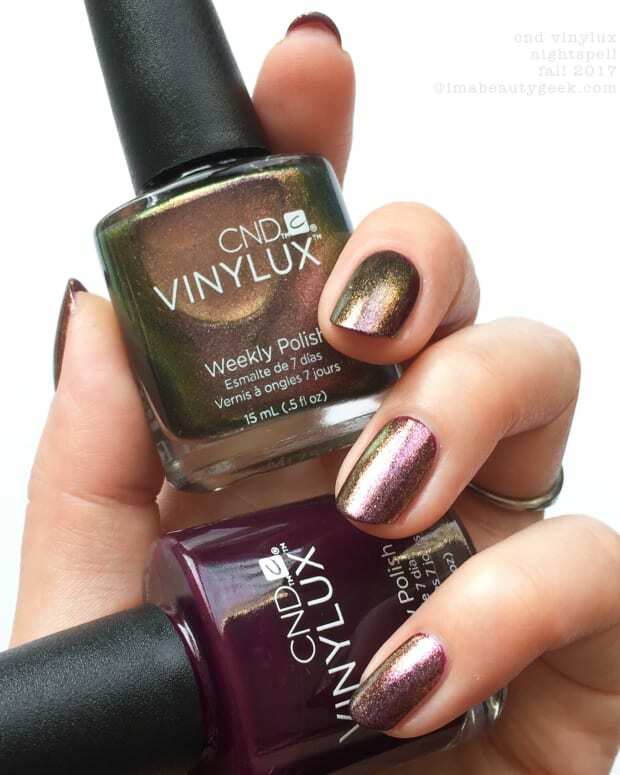 It’s now officially fall and I’ve been sitting on this CND Vinylux Craft Culture collection for a good few months now. I could have shown it to you before, but showing it it to you now means you can go out ‘n gettit right away! 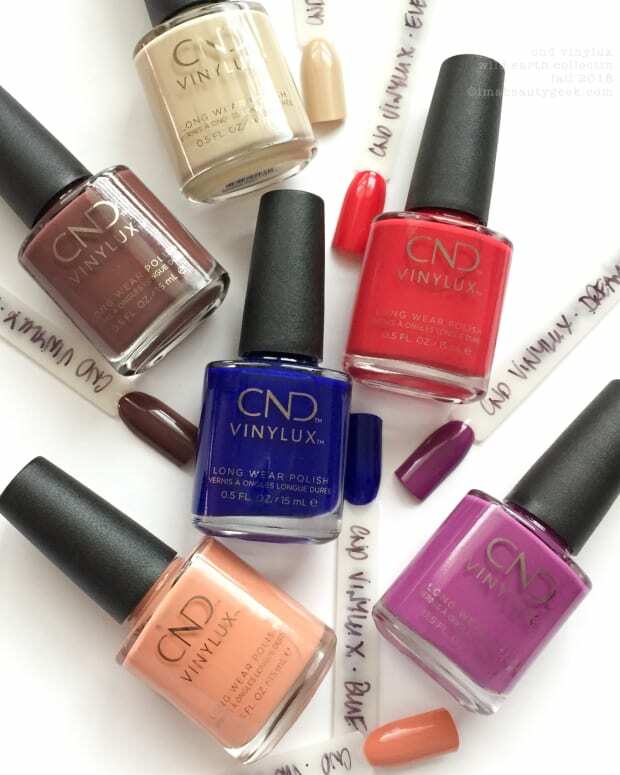 CND totally nailed it with this collection. It’s like they looked at Fall, picked out the best parts of it, and made me a very-nearly-perfect set of Hello Autumn polishes. Everything I’m about to show you went on in two coats; none of it has top. You should top though. You should always top if you’re looking to get more than a day or two. What should you top with this stuff? Uh, Vinylux Weekly Top Coat of course! 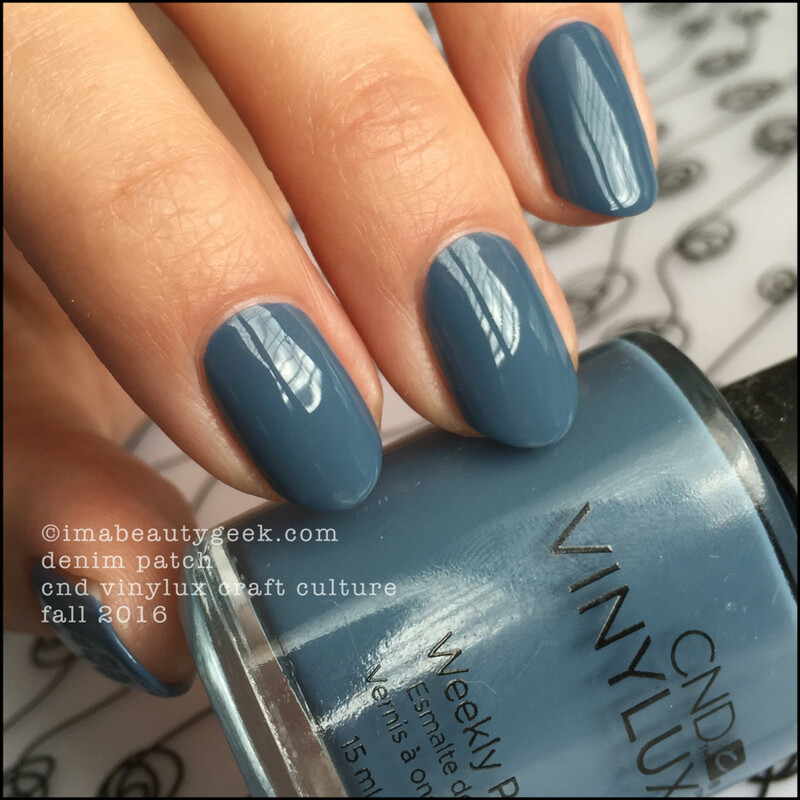 CND Vinylux Denim Patch – Craft Culture 2016 (above). This bluey-grey!! Yes! CND Vinylux Fern Flannel over Denim Patch (above). At first I thought Fern Flannel would be really transparent, but it is not. I slapped it over Denim Patch to try and save myself a coat. Turns out, two coats of Fern Flannel would look exactly the same as one coat over my Denim Patch. Happy surprise! 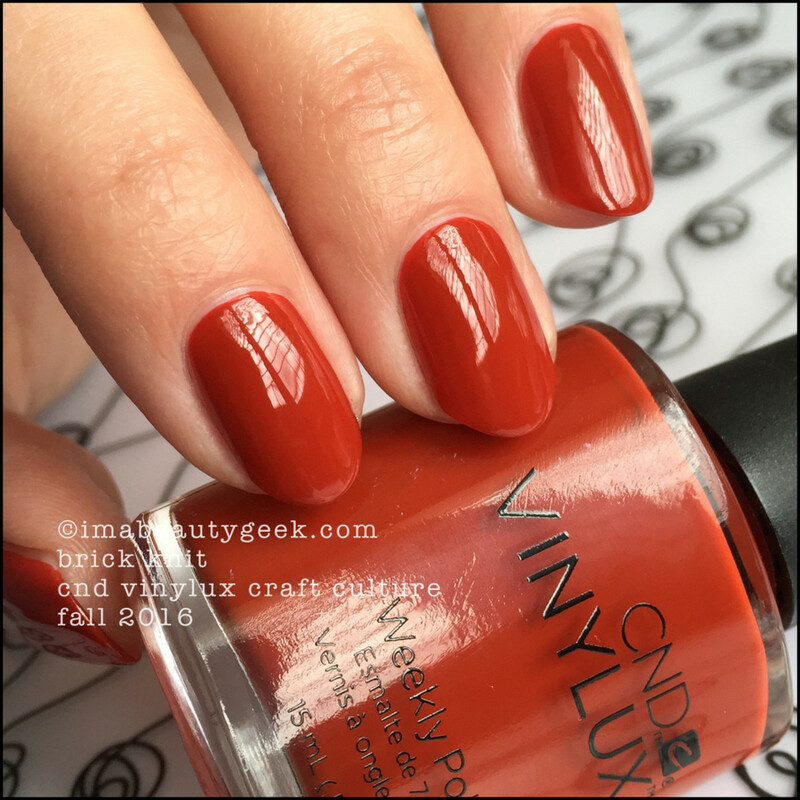 CND Vinylux Brick Knit – Craft Culture 2016 (above). How perfect is this for Fall, right? 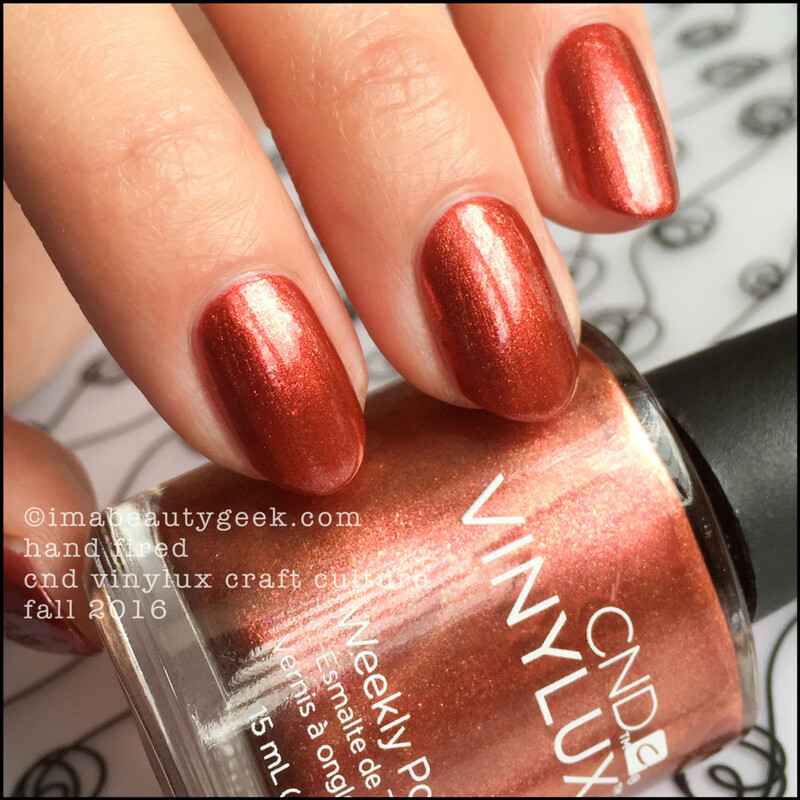 CND Vinylux Hand Fired – Craft Culture 2016 (above). Unhhh… shimmertastical flecky copper. It’s like walkin’ around with autumn on your nailz! 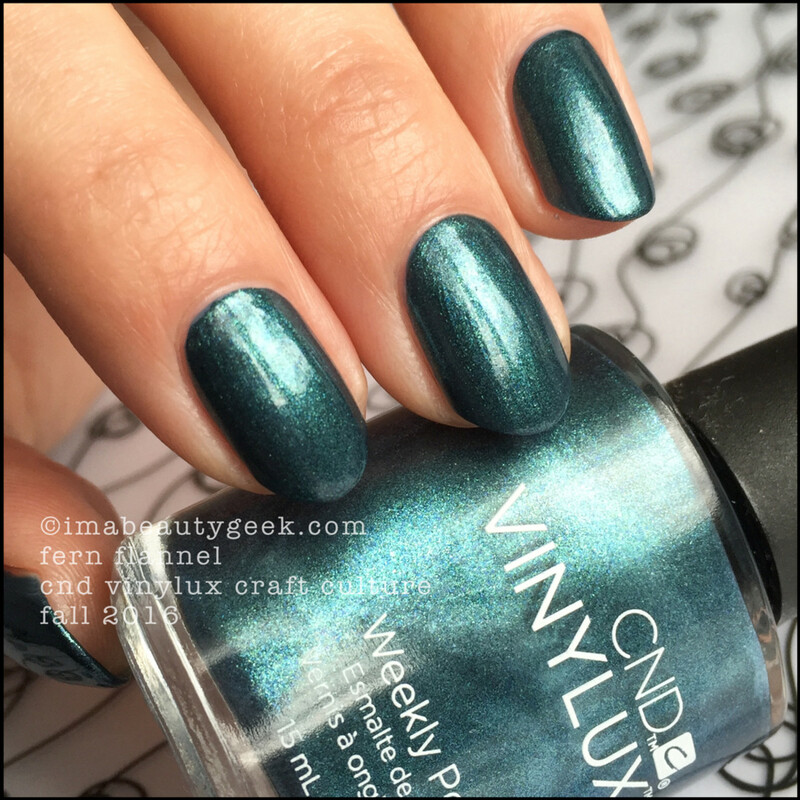 CND Vinylux Patina Buckle – Craft Culture 2016 (above). And here’s the most interesting of all. That’s two coats and it’s got a wicked opalescent pearly blue finish that goes on beautifully. No brush strokes at all! In different light, she looks like a wholly different polish. Right here is the middle-ground. I’m not sure exactly why this one speaks to me – maybe because of that old school almost-frostiness? 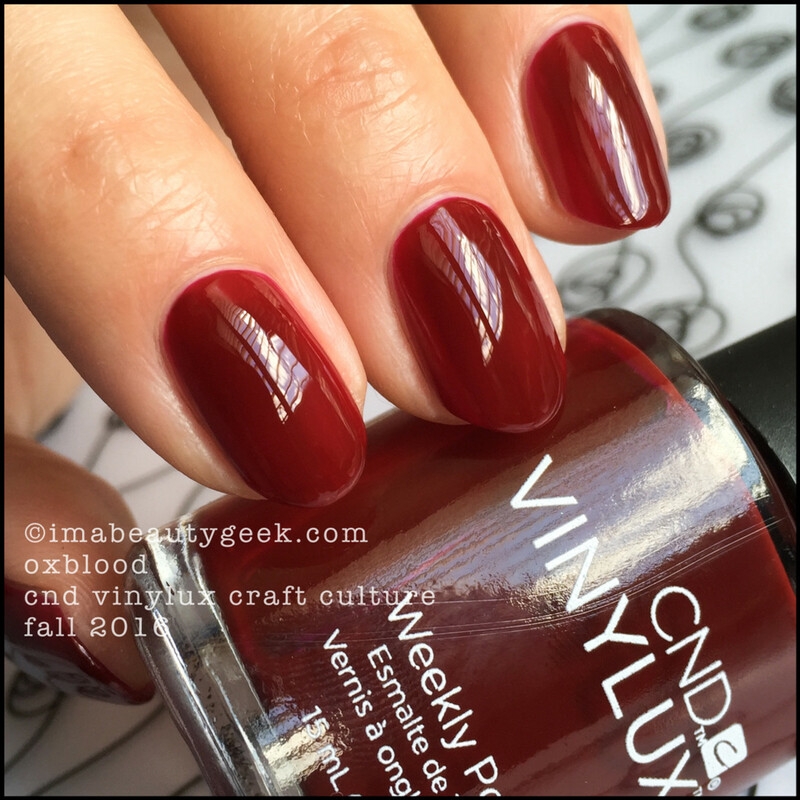 CND Vinylux Oxblood – Craft Culture 2016 (above). Okay. Truth? I’m awesomely bored with this shade and wish it would just go away. 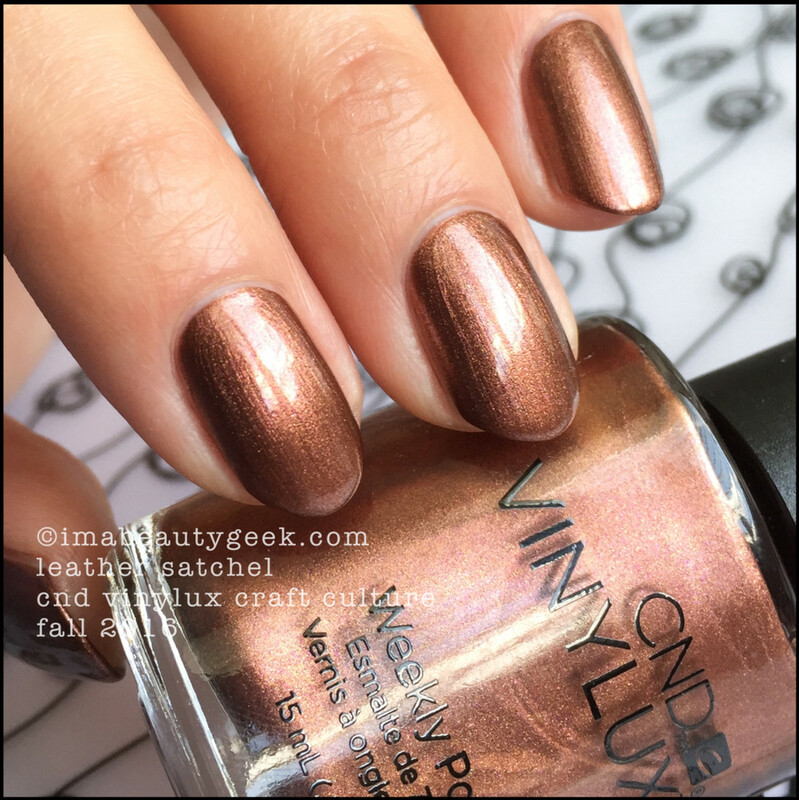 Yes, it’s perfect for Fall so I guess if you don’t have this shade (that everyone churns out at this time of year like it&apos;s pumpkin spice), you might as well get this one. By the way, this is the only formula I didn’t love. That said, I never love the formula on this shade and it doesn’t matter who makes it. It’s tacky and patchy in two coats, often needs three, and swatchers everywhere detest it simply because it stains cuticles and sidewalls. If we&apos;re not careful, it can stop all swatching dead in its tracks. Ppfft. CND Vinylux Leather Satchel – Craft Culture 2016 (above). I’m so over the Oxblood now! C&apos;mon!! Look at this shade! Winner! Gagnant! I look at it and think roasted chestnuts, coffee, crispy-crunchy night air, and fireplace. CND Vinylux Brass Button – Craft Culture 2016 (above). Holy crap! Is it yellow? Is it silver? Is it gold? Whaaaat? It’s ALL the things and I love it! I can’t help it. When a formula is this good, application is so easy, and level is magnificent, what’s not to love? If you squint, you see the yellow aspen leaves flashing around in the Autumn breeze, right? It’s not just me? I’m not crazy? So yes, I like this collection (okay, ‘cept for that one shade I’ve seen eleventy jillion times). Vinylux is one of those brands that I think is often overlooked and I’m not sure why. CND cranks out solid product on a consistent basis. Their formulas are generally spot-on and the quality control on their brushes makes me smile. I wish every company paid this much attention to my needs because really, when my polishing needs are met, you can be sure yours will be too! Availability: amazon.com and select salons all over the place. Visit CND.com/find-salon for more details.